The Humber is the “logical choice” for bringing goods into the north of Britain and critical to the success of the Northern powerhouse, the UK’s premier logistics event will be told. A powerful delegation representing the HumberPort partnership will present the case for the Humber at the giant Multi Modal industry gathering. The capabilities and advantages of the Humber, the UK’s busiest ports complex, will be showcased in a seminar entitled “HumberPort: Opening the door to the Northern powerhouse” on Tuesday, April 28, the first day of the three-day event at the NEC in Birmingham. 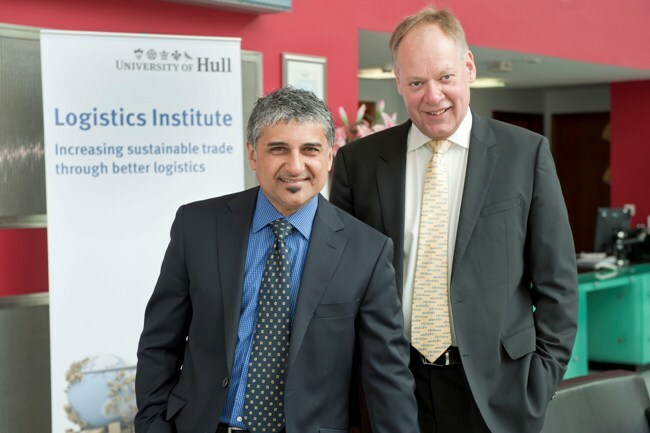 The seminar will feature presentations by Professor Amar Ramudhin, Director of the Logistics Institute at the University of Hull; Peter Aarosin, Chief Executive of logistics business Danbrit and ports operator RMS Group; John Fitzgerald, Associated British Ports’ Humber Director; and Lord Haskins, Chair of the Humber Local Enterprise Partnership. Prof Ramudhin said: “The Humber is the logical choice for shippers. Use of the HumberPort complex minimises transportation time and distance to the heart of the UK’s logistics industry, builds greater resilience in their supply chains, and improves their distribution networks. “We have a multi-purpose ports system within a unique estuary. Our message is ‘come to the Humber – whatever your type of freight, we have a port for you’. The seminar will set out the Humber’s strategic advantages, including access within four hours drive time to 75% of the UK’s manufacturing facilities and 40 million people. Mr Aarosin said it made business sense for shippers to choose the Humber as their entry point into the UK, to reduce transport time and costs, citing the example of goods entering through Southampton destined for a distribution centre in Leeds, involving a round trip of 500 miles, as opposed to 120 miles via the Humber ports. Mr Aarosin said as well as the opportunity to draw more cargo into the estuary, the Humber offered an attractive prospect for investment linked to increased imports. The HumberPort partnership is being re-energised to build on the momentum achieved by the branding of the Humber as the UK’s Energy Estuary; major investment into the Humber by big players such as Siemens; and the opportunity presented by the Northern Powerhouse concept. And Prof Ramudhin said the Multi Modal event presented an excellent opportunity to promote the Humber as vital to the growth of the Northern economy. “With the Humber on the east coast and Liverpool on the west, you have end-to-end connectivity, with trade coming in from one way or the other and logistics parks in the middle, clustered around West Yorkshire,” he added. “You could also foresee this corridor being used as an integrated multimodal route for freight coming in from the west and destined to the north of Europe and vice versa, when the right logistics infrastructure and services are in place. Mr Fitzgerald will tell the seminar about a series of significant current investments at the Humber ports, including infrastructure for the Siemens wind turbine blade factory and associated facilities in Hull. Lord Haskins will round off the seminar by talking about the £450m Able Marine Energy Park being developed on the south bank of the Humber and giving an overview of the Humber as an investment location. Multi Modal on April 28-30 is the UK and Ireland’s premier freight transport, logistics and supply chain management event. It will feature 300 trade exhibitors, including global market leaders, and is expected to be attended by 7,500 delegates.